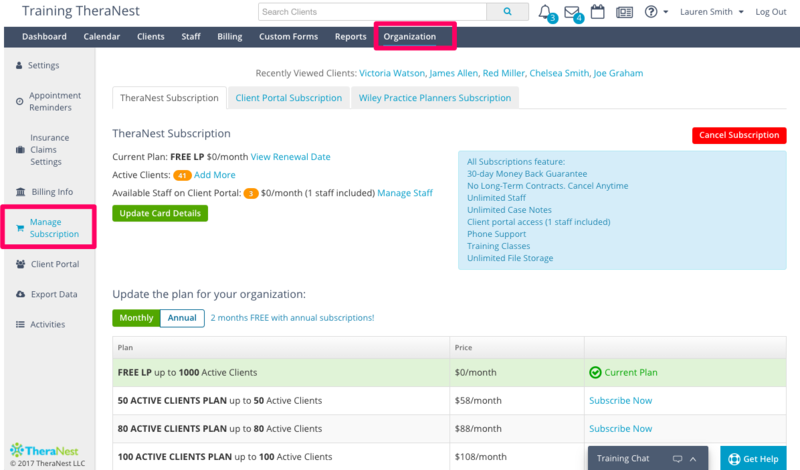 To subscribe, edit, or cancel your TheraNest subscription you must have Organization Administrations rights. Here is where you can see your current plan, number of active clients, and the available staff members on the Client Portal. You can also update you card details here as well. Once on the Manage Subscription section you will be brought to the TheraNest subscription tab. Here you should be able to scroll down and choose the plan you wish to update to. The page will be defaulted to the Monthly subscription. Click Subscribe Now next to the desired plan. If you are currently a Trial User of TheraNest and wish to subscribe to TheraNest you will forfeit the remaining days on your trial be charged immediately. To learn how to subscribe to an annual plan click here. When your subscription is changed mid month (or mid year), we do not automatically charge you on that subscription change date - we wait to charge you until your Renewal Date, which you can see on your Manage Subscription page. At that time you are credited for any unused time on the previous plan, charged for remaining time on the new plan, and then charged the full amount for the upcoming month/year. TheraNest subscriptions are charged in advance for the month to come.